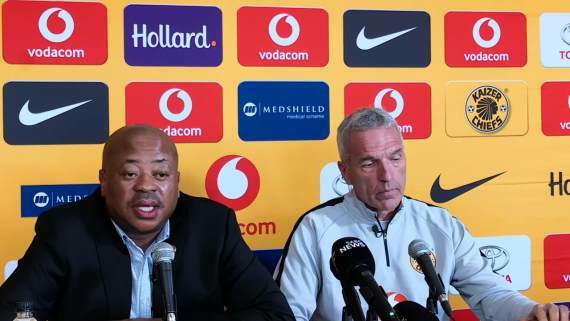 Kaizer Chiefs coach Ernst Middendorp believes his side can overturn a 3-1 first leg deficit in this Saturday's second leg CAF Confederations Cup playoff tie against Zesco United. Chiefs were handed a 3-1 thrashing in last Sunday's first leg in Zambia and appear to have plenty of work to do if they are to qualify for the group stages of the CCC. Nonetheless, while the Glamour Boys did score an away goal, Middendorp bemoaned the fact that his team weren't able to manage a second in the contest. However, he hinted that Amakhosi were ready to go to war against Zesco in order to get an historic result. Should Chiefs qualify for the group stages, it would be the first time the side have done so in their history in this competition. The German told reporters: "I would have loved to see a second goal, which would have made it a bit easier but we're quite confident in certain moments. "It will be dificult [in the second leg], there's no doubt about that, but I think we will take the chance and work around it and then we will see." "I think it's not a done affair, we have our opportunities in playing at home at FNB Stadium and hopefully we will not give away possession as often for the opponents to score. "And being able to pick up chances that we will create as we did [in Ndola], and definitely next Saturday evening too." Saturday's action is set to take place at FNB with a kickoff time of 20:00. Yet, the Soweto giants first have to face AmaZulu in a Premiership clash on Wednesday at the King Goodwill Zwelithini Stadium in Durban.